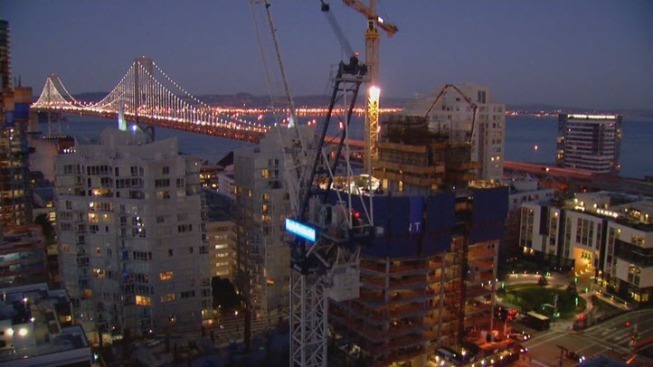 The building boom in San Francisco may be driving some longtime residents out of the city. People who are surrounded by construction projects in the South of Market district said the noise throughout the night is unbearable. "We're not happy campers and we're not sure what we're going to do," resident Bill Jaenike said. Jaenike and his neighbors at the Metropolitan on First Street report having trouble sleeping and being awaken to construction noise as early as 4 a.m.
Crews are working to build four high-rise housing projects in the area throughout the day and night. Construction workers are able to get around the 7 a.m. to 8 p.m. work rules by applying for night noise permits, which is being approved by the Department of Building Inspection. "There's a lot of interest in building more housing as quickly as possible," said Bill Strawn of the Department of Building Inspection. Ina Huang said the city should consider her family before approving overnight work. Huang is pregnant with her second child and is thinking of moving. "My daughter didn't sleep," she said. "Woke up in the middle of the night -- I didn't sleep." Strawn said night noise permits are granted when jobs are time sensitive and the work is too disruptive for regular work hours. Strawn said some requests are denied. "Eventually we agreed they can start at 5 a.m. instead of 3 a.m. to try and strike a balance," he said. Neighbors are pressuring city officials to stagger construction projects and limit work hours. But so far the race to build housing is not slowing down. "This is not a sustainable living situation to be surrounded by construction noise seven days a week at all hours," Jaenike said. Construction on the projects is expected to continue for at least two more years.